Its all about the ground hog today and it has been since the old European Days here in the early states. Before the groundhog it was the bear or the badger that helped these trappers to predict the weather. Since 1887 though it has been the groundhog in his home state of Pennsylvania to make the great prediction. Yes, if you have not heard he did see his shadow. Well with all those on lookers my question is why would he not? Maybe one day with all the technology we may be able to rig a camera to capture his outlook as he comes out of his warm underground home without everyone standing around. However, that would not be as fun so I guess that we all ready know that we have a great chance of another 6 weeks of winter and we should just simply have a day to enjoy where we hope that the little fellow may come out and not see his shadow. 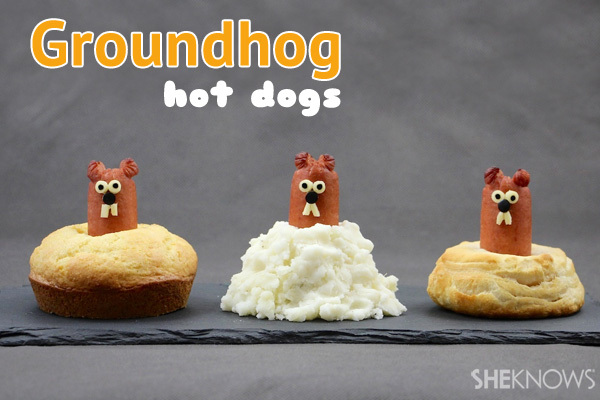 So why don't we celebrate ground hog day with a fun recipe that we can share. These groundhog hot dogs are splendid dish for supper tonight and may take the thought of six more weeks of winter off your mind for just a bit.